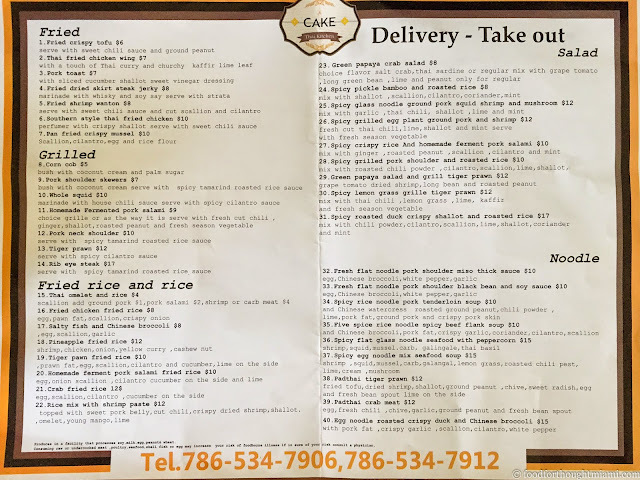 Since then, we've ordered delivery or take-out from Cake about a half dozen times, and unfortunately my experiences caused me to hold off on writing about it. 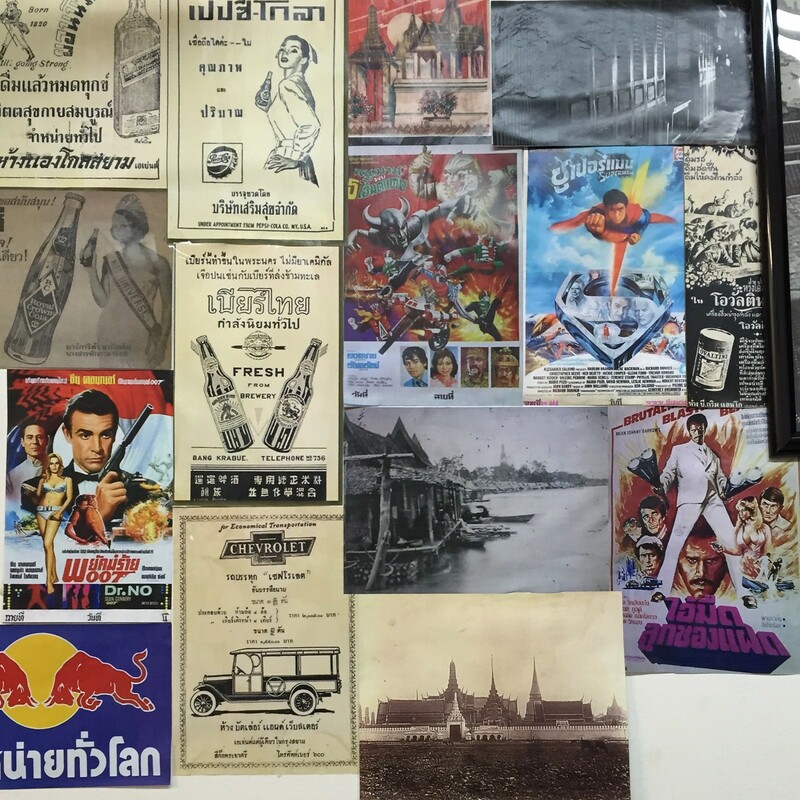 (The place itself is about as bare-bones as you can get, with just a few tables and a small counter where you order, not exactly the spot for a big night out; the highlight of the decor is the fine collection of Thai movie posters and advertisements that adorn the walls). The food has always been great – it's just been a matter of getting it. One delivery took more than two hours. 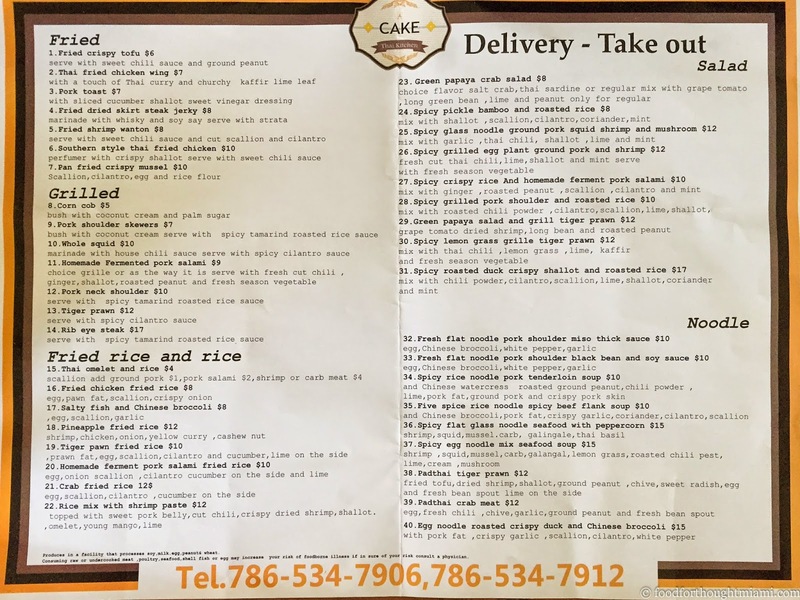 When I tried to circumvent that problem the next time by ordering online to pick up, I arrived at the restaurant only to be told that they'd never received my order. I honestly don't know how much blame here falls on Cake, and how much on Eat24. The 2-hour delivery is at least 50% Eat24's fault - the driver somehow took an hour after supposedly picking up the order to navigate a four-mile path that requires exactly two turns; but the disappearing take-out order seems more an organizational issue at Cake, which was already having trouble dealing with a "rush" of about five customers when I got there. But I will put up with a lot of tsuris for good Thai food. And the food at Cake is really, really good. By way of example, here's our last order. 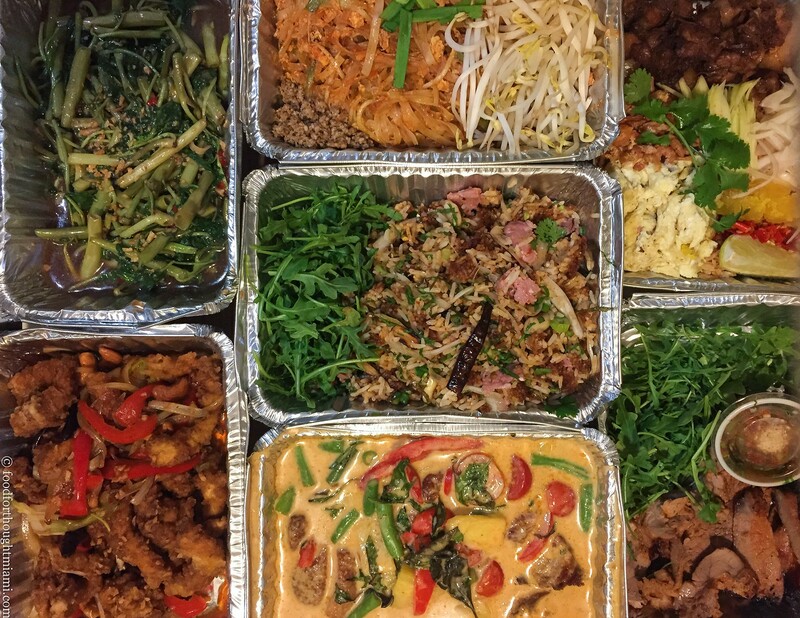 Let's start by talking about their pad thai (top center). This is a dish I usually order for the kids. I've never experienced one I liked, usually finding it sticky, sweet and insipid. Cake's version is revelatory: smoky crushed dried chilies, tangy tamarind, funky dried shrimp, briny head-on tiger prawns, savory ground peanuts, crisp fresh bean sprouts all jockeying for attention. Several of the components are nestled into corners of the container, requiring some last-minute DIY assembly. Toss it all together: now, the dish makes sense. The rice with shrimp paste (top right) is another DIY project, and another favorite of mine. The low-tide funk of shrimp paste permeates the rice, which you toss with cubes of rich, salty-sweet pork belly, shredded omelet, crisp dried shrimp, bits of tart green mango, slivered raw shallots, fresh chilies, and a squeeze of lime. It's a great dish. The crispy rice with "homemade ferment pork salami" (center) is yet another favorite, combining the lactic-fermented tang of the sausage (a/k/a "naem"), dried chili heat and bright fresh herbs and greens. The grilled sliced pork neck (bottom right) is more resilient than your customary pork satay but makes up for it in flavor. A tangy, savory tamarind and roasted rice dipping sauce wins out over the peanut sauce ubiquitous at most other places. A daily special of stir-fried morning glory, a/k/a water spinach (top left) is another dish you won't find at other local Thai establishments, the snappy shoots and tender greens given depth by a soy and chili sauce. Chicken with cashews (bottom left) is a sleeper hit, delivering much more flavor than expected from some smoky dried chilies. The only miss here was the duck with red curry (bottom center), the sauce candy-sweet and lacking the complexity and depth of the other dishes. From prior experiences I can also recommend the papaya salad (which can be had with salted crab or powerfully funky Thai sardines, almost too much even for me), the spicy pickled bamboo shoot salad (roasted rice bass notes; bright mint and cilantro treble); the flat noodles with pork shoulder, black bean and soy sauce (maybe more Chinese than Thai, but whatever, it's delicious); the crispy pork belly with spicy basil sauce; the tofu with eggplant miso and chili paste; and the green curry with flank steak, eggplant, long beans and Thai basil. And I'm still discovering new favorites on the menu every time. So here's my solution to the difficulties I've experienced getting food from Cake: eliminate technology entirely. Show up, order in person, and either eat it on the spot or wait around for take-out. When I did that last time, it took only about 20 minutes for an order for four people (OK, it was actually three people, but we were planning on having leftovers). And here's a real pro tip: while your order is being prepared, go a couple doors down to Biscayne Home Brew: in addition to home brewing supplies, they've got an excellent selection of craft beers available for take-out. Grab a beer from the fridge, bring it back to Cake, and enjoy with your meal or savor while you wait. Let's hope the Bureau never finds them. I'd venture a guess that at least 75% of the Thai restaurants in Miami also serve sushi. I don't know if this is a uniquely Miami phenomenon or not. Right now, 79th Street seems to be the demarcation point for where the gentrification of Biscayne Boulevard loses steam. South of 79th, you've got the newly refurbished Vagabond Hotel and Restaurant, 50 Eggs' new headquarters under construction, Flavorish, a new gourmet market, even a hotel / condo / retail development at the site of the old ugly INS building on the southwest corner of Biscayne and 79th. Just north, you've still got homeless people sleeping in vacant storefronts. But that may be changing soon too. Acclaimed Brooklyn pizzeria Paulie Gee's is going to be moving into the decrepit China Palace spot a block north; I expect more pioneers to follow. 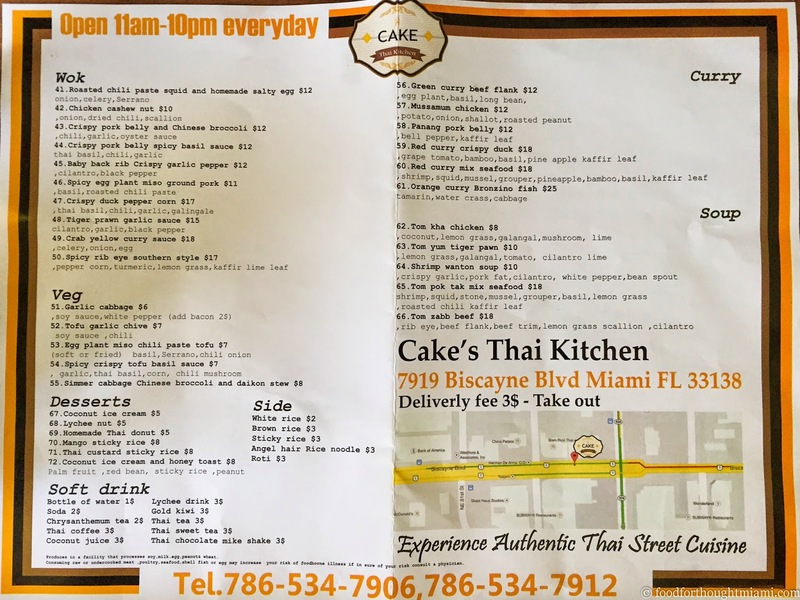 The explanation comes via a Miami Herald profile from a few months back: "Cake" is Chef Phuket Thongsodchareondee's nickname, from his mother's favorite craving while pregnant with him. Following this logic, we should have named Frod Jr. "Reuben." The Herald and an earlier piece in Miami New Times help fill in the backstory: Phuket was a cook at Bal Harbour's Makoto, and was contemplating taking a job at the new Morimoto on South Beach, when he decided to open his own place serving up Bangkok style street food instead. Eat24 customer service has been quick to offer discounts on future orders by way of apology, but also has been very quick to place all blame on the restaurant, even when their delivery driver took an hour to navigate a four mile drive. On my last visit they recommended to me the Trappistes Rochefort brown ale, which I will now heartily recommend to you. That's the sad thing about restaurants. The lack of organization will mar a restaurant's reputation no matter how good your food is. Basing on your blog, it looks like you really like Cake, and I hope they will have a better manager to take care of the confusion. 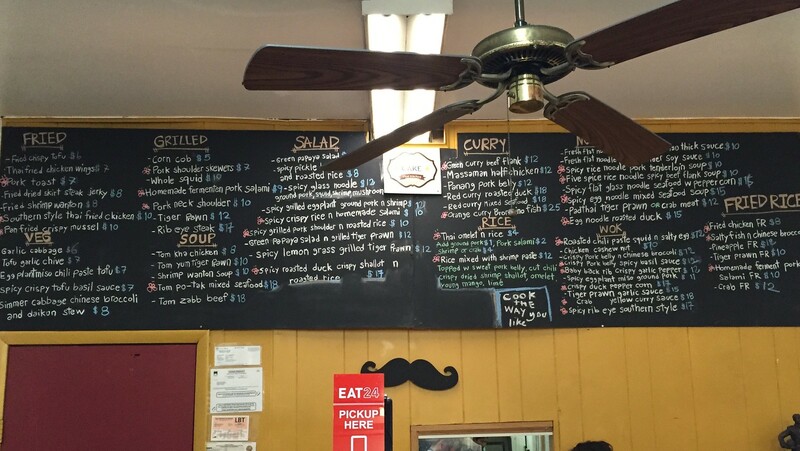 Thai food is one of my favorite types of good, and I can't wait to try this restaurant out. Management is such an important part of the restaurant industry because it can make or break a restaurant. Hopefully, it'll get better in the future.